This recipe is a little different. My mom hates Quinoa, but she actually tried it. The texture is strange but the flavoring is good. In a medium sauce pan, combine 3 cups of water, the quinoa and a pinch of salt. Bring to a boil, cover, reduce the heat to a simmer and cook the quinoa for 14 to 16 minutes, or until the liquid is absorbed and the quinoa is fluffy and tender. When the quinoa is cooked, remove it from the pot and cool slightly. Assemble the vinaigrette by combining the cumin, orange juice, olive oil, and orange zest. 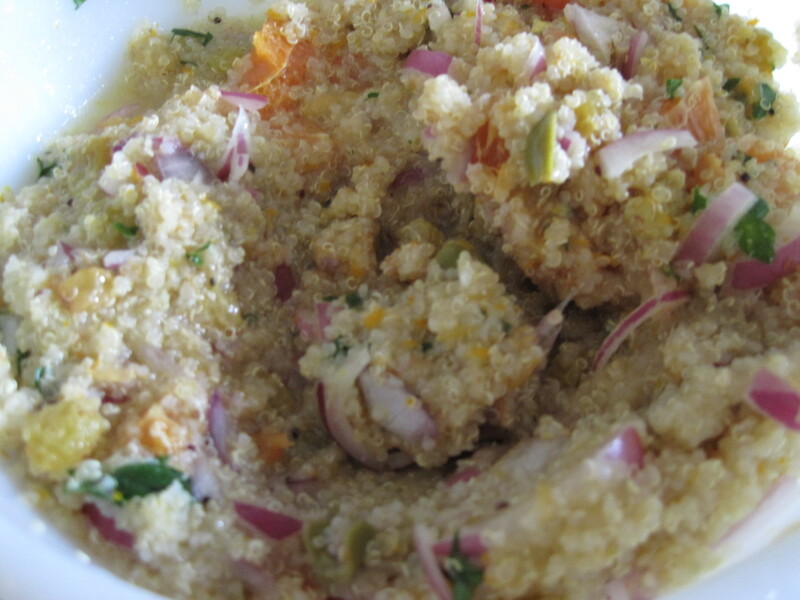 In a bowl, combine the quinoa, olives, onions, oranges and raisins and toss with the vinaigrette. Garnish with parsley. Adapted from Emeril Lagasse, Food Network.